NORTH DAKOTA, THE Flickertail State, is a land of endless fields of corn, sunflowers, wheat, and buffalo. The state has a small population but is rich in natural resources. Located in the north central UNITED STATES, North Dakota was named after the Sioux Indians who called themselves the Dakota. Rural depopulation is a serious problem in much of the state, but North Dakota also has several growing cities, such as its largest city, Fargo; its capital, Bismarck; Grand Forks; Dickinson; and Pembina. Theodore Roosevelt came here in 1883 and became a famous rancher. Today, there remains a national park named after him in the western part of the state. 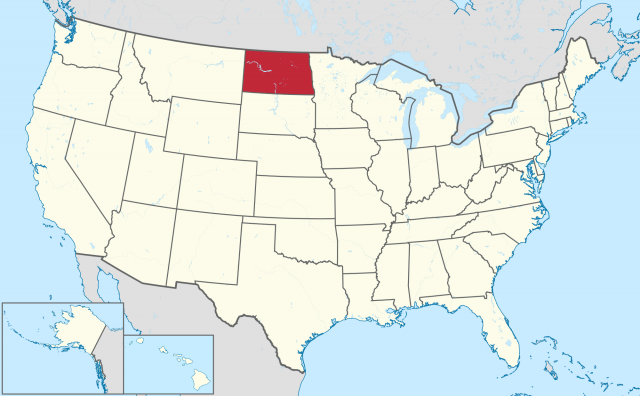 North Dakota is the 17th-largest state in land area with a total area of 70,704 square mi (183,123 square km). It is 360 mi (579 km) long from its eastern boundary with MINNESOTA and its western boundary with MONTANA. The state extends for 210 mi (338 km) from the Canadian provinces of Saskatchewan and Manitoba in the north to its sister state of SOUTH DAKOTA in the south. The 2003 estimated population was 633,837. About 95 percent of its residents are white and 4 percent are Native American. Most are of German and Norwegian heritage and subsequently most are Lutheran or Roman Catholic. North Dakota’s physical landscape can be divided into three steps going from east to west. The first, which is the most densely populated, is the Red River Valley. It has fertile soil and productive farming. North Dakota’s lowest point is in Pembina County at the Red River at 751 ft (229 m). Going west, one hits the higher Drift Prairie region, made up of dark, fertile soil, rolling hills, lakes and streams, and the Turtle Mountains on the central northern boundary of the state. The Missouri Plateau, which is part of the Great Plains, covers the southwestern part of the state. This sparsely populated area includes the famous Badlands of the Little Missouri River and North Dakota’s highest point, White Butte at 3,507 ft (1,069 m). The state’s climate is subhumid continental with short, hot summers and long, very cold winters. Rainfall is sparse to moderate with some drought periods. The precipitation increases as you go farther east. The climate and topography of North Dakota also impact its vegetation. The state is primarily prairie and plains, with only 1 percent of its land area covered by forests. At the time of European arrival, the native Mandan, Arikara, Hidatsa, Cheyenne, Yankton Sioux, Chippewa, and Dakota tribes were found throughout the state. The area was first explored by the French, was acquired by the United States through the LOUISIANA PURCHASE in 1803, and was later explored by Meriwether Lewis and William Clark. In 1861, North Dakota became a territory with South Dakota, and in 1889, North Dakota became a state. Railroads simultaneously encouraged Norwegian, Swedish, German, and other immigrant farmers to settle the area. Partially because of its extremely low unemployment rate, North Dakota has a strong economy. It is heavily based on agriculture, and the state is the country’s leading producer of barley, oats, flaxseed, and other crops. Other important commodities include wheat, sunflowers, potatoes, corn, and livestock. The state also has generous reserves of oil, gas, and lignite which contribute to the fact that energy production is North Dakota’s second most important part of the economy. The service sector contributes the largest part of the state’s gross product. Manufacturing, including food processing and machinery, is also important.